We’ve got a big bounce back and pullback forming on the Monday trading session. Is it just a relief rally or is it a supportive ‘buy the dip’ mentality? Tough to say, but it is an impressive bounce from a weekend of some big drives lower. The weekend, specifically Sunday, saw the broader cryptocurrency market nosedive to match the week of December 17th, 2018’s lows. A good amount of altcoins actually have pushed new 14-month lows against Bitcoin, but have remained fairly steady against the USD. On Sunday’s trade, Bitcoin dropped -2.9% from its open at 3619.38 to its close at 3514.24. Ethereum moved an ugly -7.22% from the open at 115.58 to the close at 115.58 – threatening to break the key $100 value area. Cardano, also experienced a deep dive dropping -8.02% from it’s open at 0.044313 to it’s close at 0.040758. But recovery has been very positive during Monday’s trade. At the time of writing this article (1625 CST), it appears the higher moves are holding. Bitcoin’s drive higher shows the close could totally envelop the closes of the past 4 trading days and the high exceeding the prior 3 days highs. The volume has also been significantly higher. It does appear that price has been halted against the 50% Fibonacci retracement at 3711.83. Bitcoin is currently below the January 2019 open at 3692.2 and below the December 2018 high of 4277. We are halfway through the month of January and if Bitcoin closes below the December 2018 high, it will be the 7th consecutive month where a monthly high has not exceeded a prior month. Additionally, it will be the 6th straight month with a lower close – a very bearish and ugly trading condition. Ethereum has had a significant rise during Monday’s trading, doubling Bitcoin’s performance today. Ethereum has moved up +10.61% from the open at 115.61 to 132.38. As with Bitcoin, Ethereum’s close on the daily candlestick could be above the prior 4 days close and the high of the Monday is already higher than the past 3 trading days. 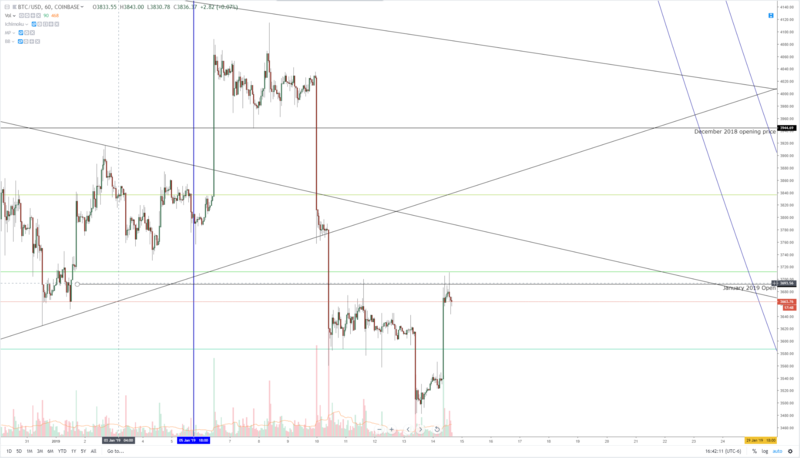 It bounced off of a very supportive and shared zone near 112, which was right against the 61.8% Fibonacci retracement from the most recent swing high of 160.62 to the swing low of 83.51. 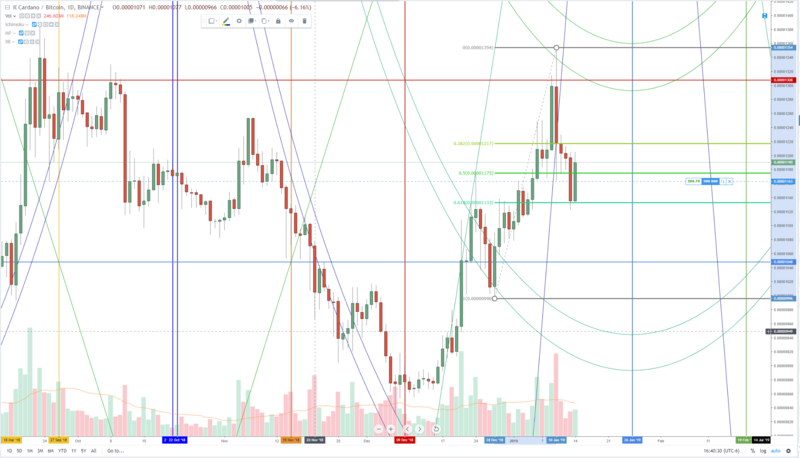 Additionally, the bounce brought Ethereum above a key 1×3 Gann angle. 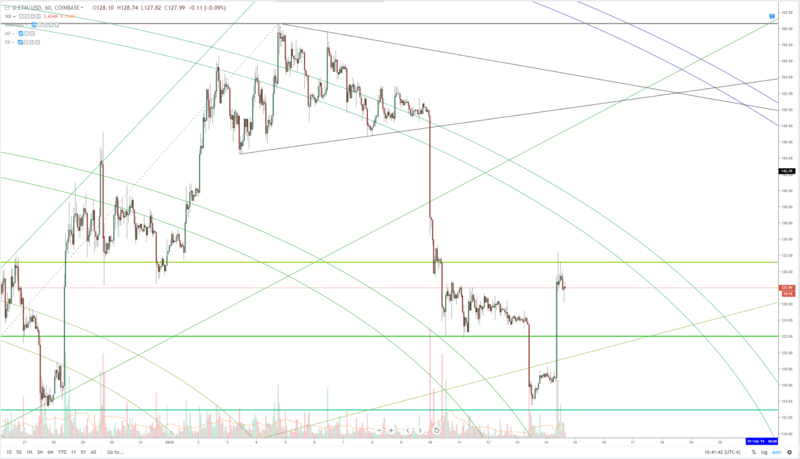 For any higher price action to occur, Ethereum needs to move beyond the arc just above it and the 45-degree angle, which is near the 150 value area. Cardano has also experienced a big drive higher. While Cardano’s BTC trading pair (ADABTC) has moved up 5%, its USD pair (ADAUSD) has moved as much as +10% for the day. Sunday’s close and Monday’s open are almost literally on top of the 61.8% Fibonacci retracement level at 0.00001133. Traders pushed Cardano past the 50% retracement level at 0.00001175 to the current intraday high of 1205. While the high of the day is above the prior day’s high, it doesn’t appear that the close will be able to trade above Sunday’s open. There is also some pressure at the 38.2% Fibonacci level at 0.00001217. Price is approaching an important 4/8th time-harmonic on the 25th of January. Depending on the condition of the Bitcoin and Ethereum, Cardano should experience a significant and violent drive higher, or an equally powerful move lower. I am anticipating a drive higher and beyond the arc above price near the 0.00001500 value area.